1st ODI India vs New Zealand: After Virat Kohli showed us his moves on a segway, former India skipper MS Dhoni too impressed fans with his amazing display of balance on the segway. 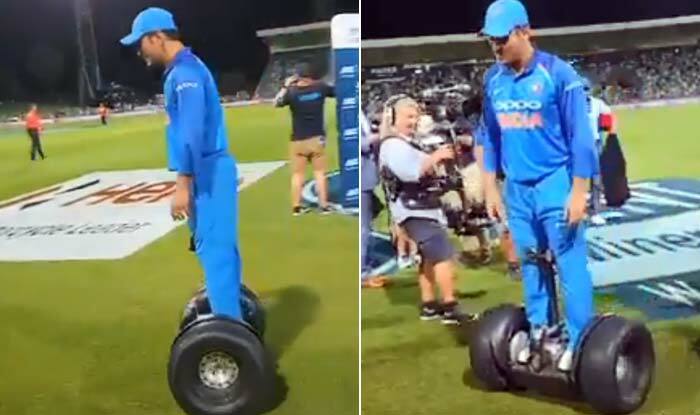 1st ODI India vs New Zealand: After Virat Kohli showed us his moves on a segway, former India skipper MS Dhoni too impressed fans with his amazing display of balance on the segway. Dhoni looked cool and composed as ever as if he has been doing it forever. Team India was in high spirits after the eight-wicket win to take a 1-0 lead, and the post-match shenanigans indicated just that. So, who was better at the segway? It is very difficult to pick one as both the star cricketers did it well. Kohli, showed off a Dharmendra pose it seemed while on the segway. Meanwhile, Kohli recently bagged three major awards at the ICC awards function. Kohli became the first player in history to win the Sir Garfield Sobers Trophy for ICC Cricketer of the Year, his second consecutive, the ICC Test and the ODI Player of the Year awards following an extraordinary 2018. On the other hand, Dhoni bagged the Man of the Series award in Australia as he showed consistency by amassing 193 runs in the three-match ODI series. Earlier in the day, it was the bowlers who set up the win for India. Shami, Chahal, Kuldeep combined to bundle out the hosts for a paltry 157 runs. Shami, who delivered a man of the match-winning haul of 3/19 in the first ODI against New Zealand here, failed the ‘Yo-Yo’ fitness test last year and was also bogged down by some personal issues.